With the Battery Manager Standard Edition (SE) you get the perfect solution to manage batteries and charging devices. In addition to the embedded database you may access one external database like Oracle or MySQL allowing you to access your data also from home. Multiple users can work together with your data so that the tasks may be performed by multiple persons. In addition to the embedded database shipped with the Battery Manager the Professional Edition provides support for one single external database (like Oracle, MySQL). External means that the database is managed by a special database server in most cases. External databases allow working with multiple users in Battery Manager. If multiple clients e.g. for multiple branches are required later then upgrading to the Enterprise Edition is possible at any time. The datasets from the external database can be transferred into both the embedded or external databases. You can create backups on a regular basis directly from the running application to be restored later. 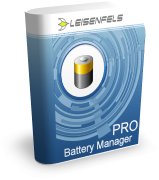 The Battery Manager Professional Edition provides support for accessing remote servers connected via protocols like FTP/SFTP. Connections may configured using a special dialog, where the basic parameters of each connection are specified: the host name or IP address, the protocol and port, the remote path as well as the credentials to login (username and password).